This heavy metal 5 reel is sound tracked by all your favourite Guns and Roses classics. 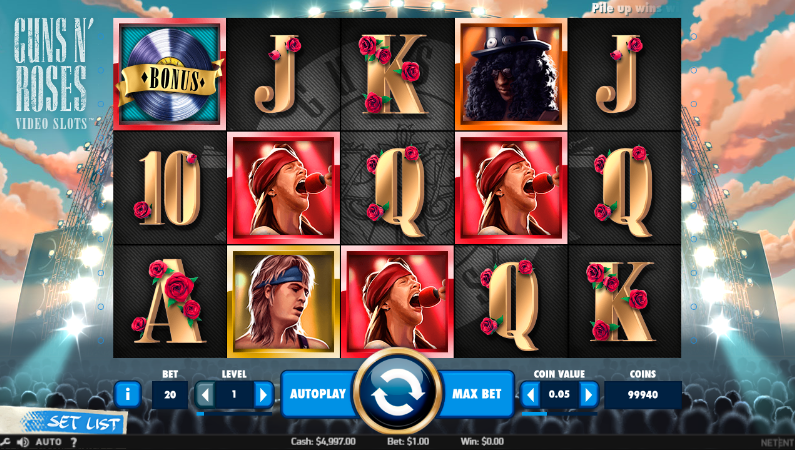 If you’ve always dreamed of playing this online slots while listening to ‘November Rain’ then this is the game for you. 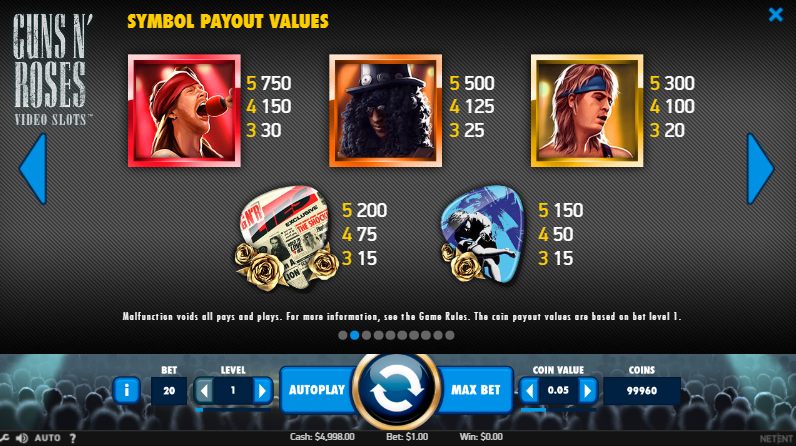 Join Axl and Slash in the rock n roll hall of fame as you unlock free spins and multiplier bonuses. Play today! NetEnt continue to over-achieve and over-achieve by constantly pushing the boundaries of what is expected of a slot game, and rightly deserve their place as one of favourite developers here at casino slot games online. They always seem to find games that have great themes that everyone loves or deliver their own storylines that gamers can get on board with everyone. I bet if you told the CEO of NetEnt games in 1996 that they’d be making the official Guns and Roses Slot game then you’d be laughed out the room. But here we are. Guns and Roses are arguably the biggest rock band there’s ever been. Rising to fame in the 80s with songs like Paradise City, November Rain and Welcome to the Jungle, their image became something of a cult and their logo still permeates contemporary culture today when visible on many unaware teens t-shirts. This slot game certainly takes the ‘Rock Band’ slot game to another level and this is evident when you hear the soundtrack. Soundtracked by some of Guns and Roses most prolific tunes and backed by realistic live crowd noise you really feel like you’re right there in the moment with Axl and Slash. As you begin to play this game you will be greeted with a cinematic short of some of the greatest moment from Gun’s and Roses historic videos before being launched into the chaotic gameboard that features all the familiar band members along with some plectrum that act as the lower valued symbols. In essence, there’s 5 reels and 25 paylines, however this game offers so much more than that. This video slot includes several bonus features that can be triggered by matching symbols across the reels. 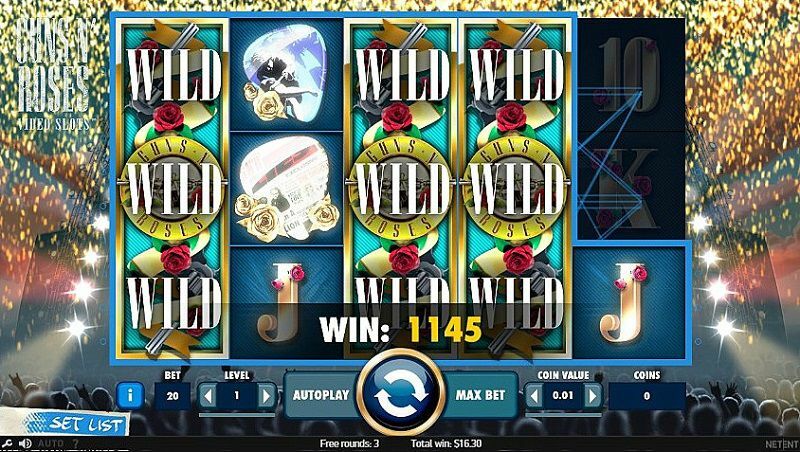 The WILD symbol of this game is the iconic Guns and Roses Logo and can be substituted for any symbol across the reels to put together a massive win combination deposit by mobile. This is where it gets tasty. If you see match 3 bonus reels anywhere across reels 1, 3, and 5 you will immediately enter the bonus round where you will stake your claim at winning some ENCORE free spins or extremely generous cash prizes. All amounts for the Bonus Wheel are visible across the wheel. The Bonus Wheel is a sort of Guns and Roses themed wheel of fortune. A Guns and Roses slot game really does speak for itself. 5 reels of roaring Rock and Roll is what you can expect when you play this game. The soundtrack and live crowd noise really does take this game onto another gear and this coupled with the generosity and player value that it outputs is the reason why it’s up there with some of the very based online slot games around. 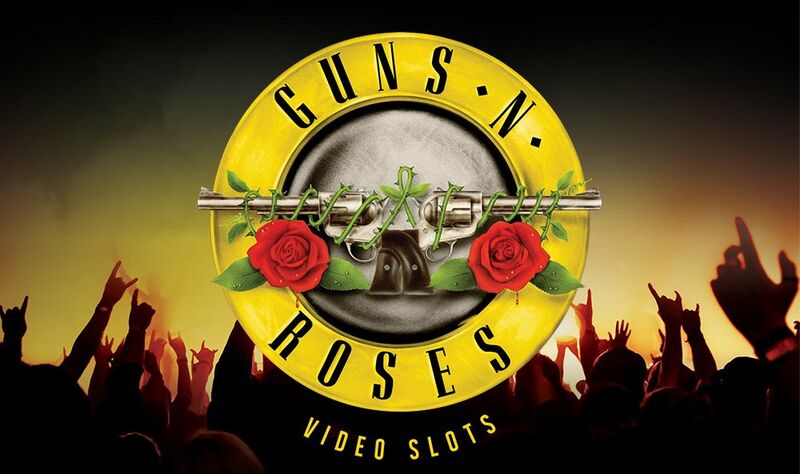 If you’re a fan of the Guns and Roses slot then you will certainly enjoy some of NetEnt’s other games that are playable across the Wizard Slots platform, such as Gonzo’s Quest.